Self-driving vehicles, traffic lights that adjust based on vehicle flow, bike sharing and smart pavement that provides public Wi-Fi access—those are just a few of the ideas for making cities smarter. Not only have municipalities embraced the smart city concept—using technology to manage a city’s assets, improve the efficiency of services, reduce consumption of resources, reduce costs and improve the quality of life—but many are making it a reality. The U.S. Department of Transportation has joined in to help cities implement smart city ideas, and it is offering a $40 million grant to the winner of its Smart Cities Challenge. The prize will go to the city that has the best plan for integrating innovative technologies such as self-driving cars, connected vehicles and smart sensors into their transportation network. Recently the seven finalists made their final pitches, offering their ideas for the future of transportation. Below is a look at what they propose, including their video pitches. The winner, which will be announced this month, will also receive $10 million from Vulcan Inc., as well as expertise, software and products from several companies involved in transportation, communication and environmental technologies. Thanks to Austin’s economic energy, which includes a job market that grew during the 2008 recession while other cities’ shrank, the city has more people than ever living there. In fact, it has twice as many people as it did 30 years ago. Add to that the visitors who flock there for its music and social scene, and you have an urban mobility mess. Connected and automated cars: This builds on work Google is already doing with its self-driving cars. Austin’s proposal includes a prototype autonomous shuttle from the airport to the nearby smart station. Smart stations: These transit hubs bring together a variety of transportation services to help visitors. They serve as centers for deploying autonomous and connected cars, taxis and urban freight. Mobility marketplace: The idea is to connect travelers to the best mobility option for them and provide integrated payment options, real-time travel information via an app or a kiosk. Columbus has a three-pronged approach for its future: to be a beautiful city, a healthy city and a prosperous city. That includes connecting all of its neighborhoods, designing safer streets, ensuring all residents have access to quality and affordable transportation, and reducing consumption and emissions. Real-time information about traffic and parking conditions and transit options to minimize traffic issues associated with major events or incidents. Smart corridors to improve transit service and efficiently. This may include traffic information boards and electronic signs warning of incidents and providing detours. Expanded usage of electric and smart vehicles. Enterprise data management ecosystem: The system will incorporate data from many sources to provide a real-time picture of travel in the city, including where people are moving and how they’re getting there. Mobility on demand enterprise: Using information in the data management ecosystem, the city wants to create an app and interactive kiosks that integrate all public and private transportation providers. The goal is to help people decide the best transportation option for them. Transportation electrification: The city wants to add 103 electric vehicles for its fleet, including buses, taxis and car-sharing vehicles. To support them, the city plans to install 120 charging stations citywide. In recent years, Kansas City has experienced a city-wide revitalization. It has a thriving technical sector, a vibrant arts scene and the championship baseball team Kansas City Royals. It is no longer a fly-over city, and the growth in population and visitors is affecting the ability to easily travel in and around it. Autonomous shuttles will be tested at the city’s airport with the potential to also run downtown. Pedestrian mobility apps will inform drivers if a pedestrian with a disability is crossing the street and will give the person more time to cross the street. Sensors will be used to monitor and improve mobility, emissions and safety, as well as provide smart street lighting. When Pittsburgh’s highway system was built, it provided a quick way into the business district but it created problems that the city is trying to fix today—bisected neighborhoods and increased asthma rates of people living near the highways, to name a couple. Plus, streets originally built for horse carts need to accommodate cars, busses, freight vehicles, bicycles and pedestrians. Surtrac: This real-time adaptive signal control system will monitor traffic and control lights on the streets that feed into downtown Pittsburgh. As part of the system, traffic lights would use sensors to identify transit and freight vehicles and allow them to move through the signals quicker, thereby reducing pollution that would occur while the vehicles are idling at a stop light. Autonomous shuttle: The city proposes using Second Avenue, one of the main streets that goes into the city, to test the use of self-driving autonomous transit vehicles. A charging canopy would be included. Portland is at the forefront of alternative modes of transportation (it’s hard to find a community more pro-bicycle than it), but it still has issues. Transportation safety for those bicyclists, as well as pedestrians and car drivers, is one challenge. It also wants to reduce its carbon emissions by 80 percent. City organizers say the smart city initiatives proposed will address those. 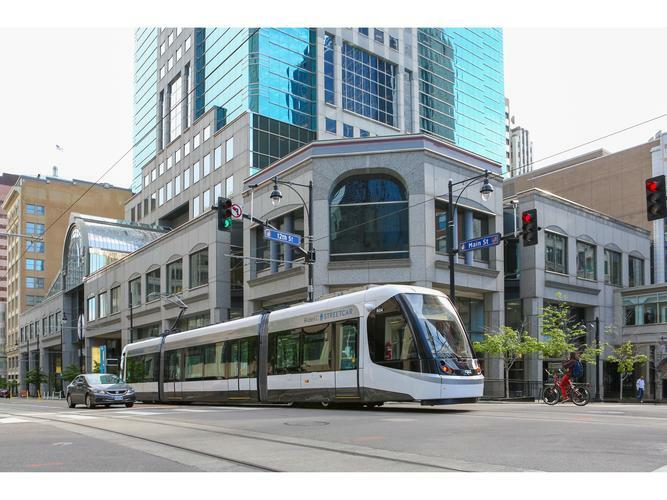 The core of the plan includes an app that would allow residents to compare transportation options—walking, driving, taking public transit or using a ride service—and pay for the option they choose within the app. Building traffic sensors and signals that can receive and transmit data, and installing technology in fleet vehicles to collect data on traffic conditions. Installing Wi-Fi-enabled kiosks that provide internet access and travel information at transit stops. Adding electric neighborhood shuttle buses to its transit service. The goal is that eventually these vehicles will drive autonomously. San Francisco has been part of the international network of smart cities since 2011 and has been sharing its practices with its sister cities: Paris and Barcelona. It has used technology to make its building operations more efficient, reduce energy use, streamline its waste management system and expand its transportation system. But city officials recognize that they can do more. The city’s new proposal is to expand and integrate mobility services across the city to incorporate shared connected automated vehicles. It would be a network of shared vehicles, accessible by an app. Officials say the network will eliminate traffic congestion, improve traffic safety, reduce emissions and noise, and more. “Combined, shared mobility, public transit and CAV technology can reduce demand for street space and parking so that public right of way can be repurposed over time for walking, cycling, open space and to create more affordable housing,” the city’s proposal says.